Who can name all the things wrong with this? Ready, go! The way people justify pricing cars is frustrating. 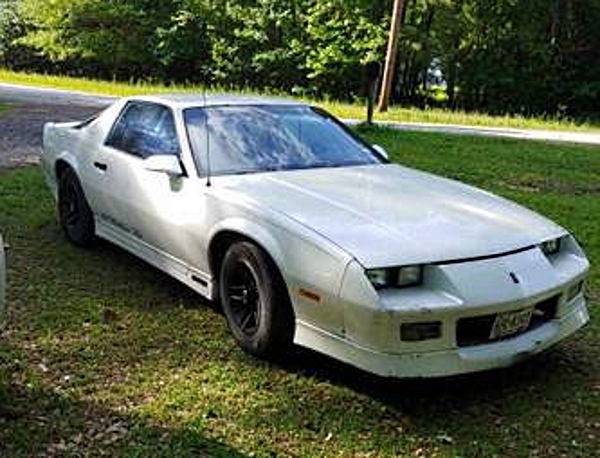 Hagerty probably says 13500 for a clean unmolested original Iroc. This looks like an RS with a terrible respray and the country boy sh*t kick treatment. He can ask whatever he wants. Doesn't mean he'll get it. If he does... well good for him. Pipedreamer. Lots of them watch Barret Jackson. ROFLMAO @ "Hagerty has it valued around $13,900." ^^^^This. Beejay has done more damage to the performance car/hot rod market than any ten other entities combined. Last edited by ironwill; 04-14-2019 at 03:02 PM. These ads make me feel good about my beater. I like when they put "I can smell a scammer a mile away'' or ''Don't try to low ball me,I know what it's worth'' in their listing. I know this listing does not have these statements but I have seen many of listings that do. Oh come on, pull a $500 beater out of the shelter belt, blow on some Duplicolor, drop in some sickass Rockwood beats and a Kenford head unit... What else you gonna do to support your meth habit? IROC badge on an RS is the first thing wrong..
Ads like this will help to make my car look good when it goes on the block for ~$10K. What I find troubling is the misrepresentation of the car. It is not an IROC period. This is deception that could cause someone to pay more for something it is not. There is laws against this, just not for private party sales I guess. The rest of the ad I just find to be amusing and have come to realize that some peeps truly think they have a beauty and there is no changing of opinions no matter what the picture holds! Vaccum hose removed- shouldn't I hear a hiss? Has anyone used hawks replacement rocker and bumper emblems?